Few people of the present day are capable of rightly appreciating this heroic deed, this brilliant proof of human courage and energy. With two ponderous craft - regular "tubs" according to our ideas - these men sailed right into the heart of the pack, which all previous explorers had regarded as certain death ... These men were heroes - heroes in the highest sense of the word. - Roald Amundsen, writing in 1912 of the Erebus and Terror expedition to Antarctica with James Clark Ross. Erebus and terror were designed as "bomb ships" for the naval bombardment of shore targets. The main armaments were large bore mortars which weighed 3 tons each and required that the ships be considerably reinforced for the punishing work that this entailed as the mortars had a powerful recoil. Thus they were suited for polar exploratory work by virtue of being stronger than other similar ships available at the time. The ice strengthened sealing and whaling vessels used in later polar expeditions were not available in such numbers at the time of the Erebus and Terror missions. They also had capacious holds for all of the stores that were needed and had shallow drafts (eleven feet) to get close in to shore. Hecla-class bomb ship / 3 masts/ L,B,D 105' x 28.5' x 13.8' - 32m x 8.7m x 4.2m / 372 tons / Hull: wooden / Complement 67 / Arms: 1 x 13" mortar, 1 x 10" mortar, 2 x 6pdr, 8 x 24 pdr / Designed Sir Henry Peake / Built: Pembroke dockyard, Wales 1826. Vesuvius-class bomb ship / 3 masts/ L,B,D 102' x 27' x 12.5' - 31.1m x 8.2m x 3.8m / 325 tons / Hull: wooden / Complement 67 / Arms: 1 x 13" mortar, 1 x 10" mortar, 2 x 6pdr, 8 x 24 pdr / Designed Sir Henry Peake / Built: Davy, Topsham, England 1813. Terror saw war service in 1812 in the Crimea, but was then laid up until 1828. She was damaged near Lisbon and withdrawn from service after being repaired. In 1836 Terror sailed to Hudson Bay under the command of George Back with the intention of reaching Repulse Bay - which she never did. She almost didn't survive the winter, at one point being pushed some forty feet up a cliff before the ice subsided. Ten months after entering the pack Terror limped to Ireland where she was beached and repaired. Both ships were ketch rigged to reduce the amount of rigging that might interfere with a high-angled mortar shot. In preparation for the voyage to Antarctica, the admiralty dockyards doubled the thickness of the ships decks with a layer of waterproof cloth being sandwiched in between the old and new layers. The interiors of the two ships were braced fore and aft with oak beams to resist and absorb shock from ice. The hulls were scraped clean and double planked and finally the keels were sheathed in extra thick copper plate. Triple strength canvas was fitted for the sails. They ships had sail power only for the Antarctic expedition, but were fitted out with single screw propellers powered by 20hp engines for the Northwest Passage voyage. 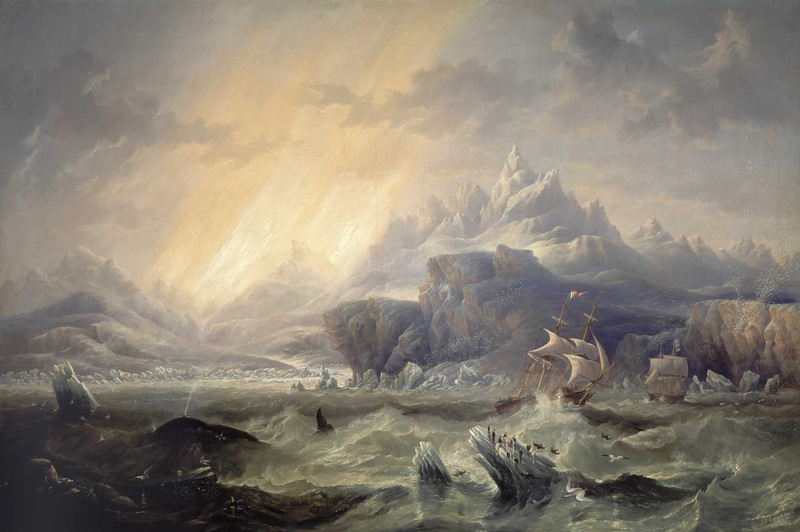 Antarctic expedition, 1839-1843, James Clark Ross. The atlas of 1816 was littered with blanks. What was the North Pole? Was there a Northwest passage? What lay at the heart of Africa? Did Antarctica exist? In his quest to find the answers to these questions John Barrow, Second Secretary to the Admiralty, launched the most ambitious programme of exploration the world had ever seen. 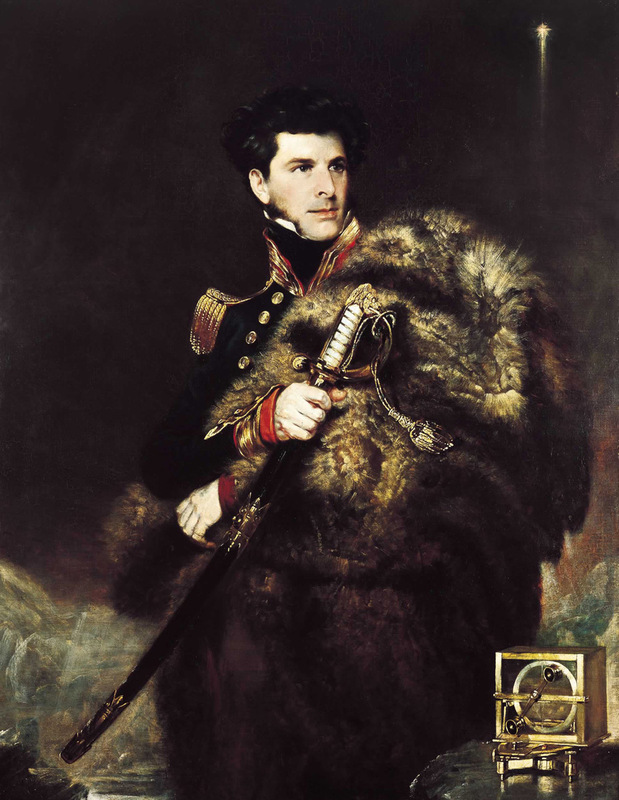 James Clark Ross was an Englishman who by 1839 was the most experienced polar officer in the world. He had successfully located the north magnetic pole (1831) and had spent eight winters in the Arctic, having been there for seventeen of the previous twenty years. He was also reckoned by some to be the most handsome officer in the Royal Navy. What better credentials could he have to lead this latest of John Barrow's - the Second Secretary to the Admiralty - latest quest. Ross sailed south for the Antarctic in the autumn of 1839 in command of the Erebus and Terror, the aim was to find the south magnetic pole. This was to be part of Britain's contribution to an international year of co-operation whereby European nations would set up magnetic observatories around the world, coordinating readings on fixed dates and comparing readings. The expedition was extremely well equipped by any standards. There were stores for three years including large amounts of vegetable soup, pickled cabbage and carrots to keep scurvy at bay. There were ice saws, portable forges, winter clothing for every man and even a small flock of sheep. Each ship held a crew of sixty four. They did not handle well (partly because of the shallow draft) though they represented the epitome at the time of naval ingenuity. No sailing ships before or since that time were better prepared for their task with such fine attention to detail. 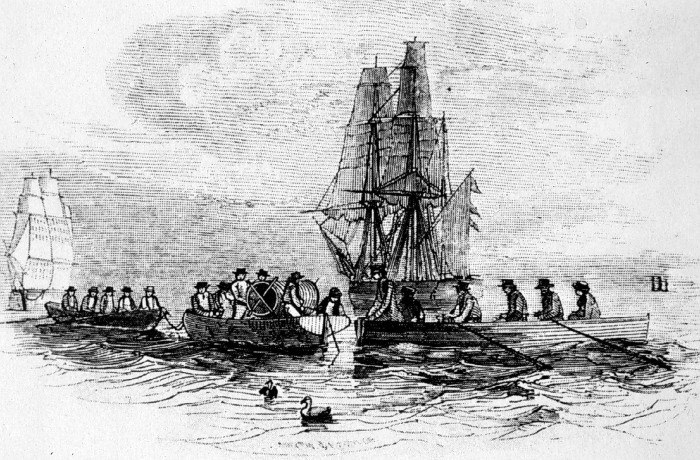 "It is not easy to describe the joy and light heartedness we all felt, as we passed the entrance to the (English) Channel, bounding before a favourable breeze over the blue waves of the ocean, fairly embarked on the enterprise we had all so long desired to commence"
Boats from HMS Erebus and HMS Terror - Sounded in open ocean at 27.43 S and 17.48 W. Recorded depth of approximately 2200 fathoms. First modern successful sounding in deep ocean. Progress south was rather less hurried than subsequent voyages and it was a year after leaving England that Ross eventually left Hobartstown in Van Diemen's Land (today known as Hobart in Tasmania) for the Antarctic Ocean. Rather than go directly he first sailed to the 180th line of longitude and then turned south, this was partly to avoid rival French and American expeditions under D'Urville and Wilkes respectively. Ross had also learned from sealers that at this 180th meridian they had seen a lagoon-like stretch of open water beyond the pack ice. The first iceberg of the voyage was sighted just after Christmas Day in 1840, on New Year's Day 1841 the ships crossed the Antarctic Circle. Warm weather clothing was issued free to all of the crew. They came to the pack edge on the 3rd of January, there was open water beyond the consolidated edge, open narrow leads rather than the lagoon they had heard about, but open navigable water nevertheless. Ross picked his point and rammed the edge of the ice with the Erebus. For an hour, he repeatedly rammed the same spot - this in a sailing ship it must be remembered. Eventually it gave way and the two ships could pass through between the mass of open sea and ice floes, they wormed their way ever southwards. Ross pushed through the pack, his strengthened bomb ships being able to do this unlike those of D'Urville and Wilkes. After a week, by the 9th of January, he was through the band of pack ice into an "open polar sea", the "lagoon" the sealers had spoken about. Now all eyes looked to the south straining for a glimpse of land. The ships were in a region that had never been visited by man before and all those on board the two ships were filled with a sense of awe at their achievement and what they were beholding. The dipping needles they carried showed that the magnetic south pole was very near by. On January the 11th land was sighted, a range of mountains which Ross called the "Admiralty Range". This was a time in which any new land seen in this region was the first time it had ever been seen. There were no native peoples and discoverers could name features as they pleased as long as they stayed within certain conventions. Thus "Cape Adare" was named after a friend and "Victoria Land" after the recently crowned English queen, other features followed thick and fast. "We had discovered a land of so extensive a coastline and attaining such an altitude as to justify the appellation of a Great New Southern Continent." Ross had stumbled into one of the "bites" taken out of the otherwise rounded shape of Antarctica in an area that was to become known as the "Ross Sea". 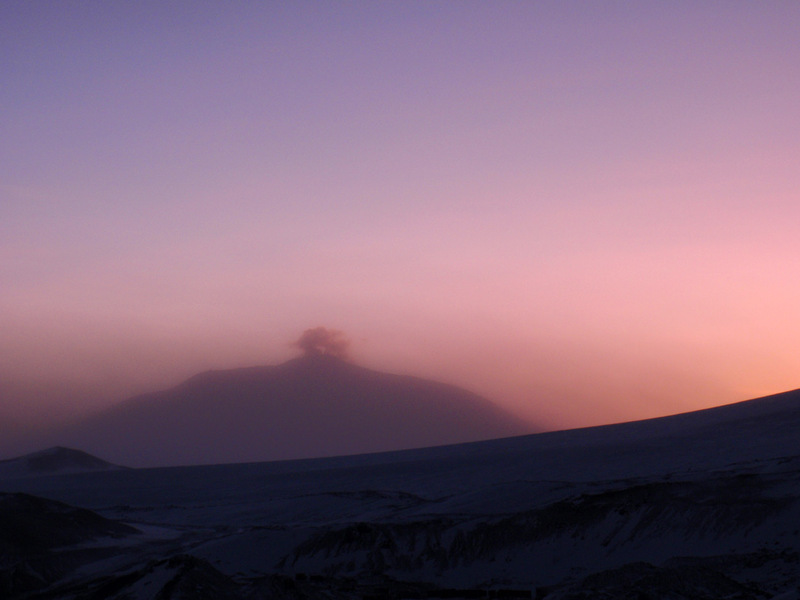 After following the mountainous coastline for two weeks, an active volcano was sighted rising 12,400 feet skywards from 100 miles away in the incredible visibility common in Antarctica. The volcano's peak appeared to flash red fire at night and by day streamed a dark vapour cloud. Ross named it Mount Erebus after his ship and another smaller and extinct volcano rising to 10,900 feet, further to the east Mount Terror. On reaching nearly to Mount Erebus Ross encountered a feature he called the "Great Ice Barrier" at 78° 4'S, a wall of ice rising 160 feet out of the sea and "...extended as far to the east and west as the eye could discern" that prevented any further sailing south. He called the sea at the point where he met the barrier "McMurdo Sound" after the first lieutenant on the Terror. The ice barrier could not circumvented nor seen over, landing was impossible as the barrier's ice wall was vertical. 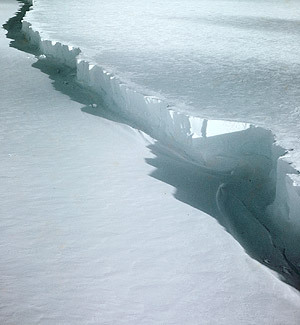 What was not known, but has been discovered since is that the barrier represents the front edge of a vast ice shelf flowing from the Antarctic interior 1,000 feet deep and extending for about 1,000 miles. As an experienced Arctic navigator - he had spent four years in the ice a decade before - Ross realised that the entry through the band of pack to the great ice barrier may have been a freak and it could easily close behind them, never to open again. The Antarctic was not like the Arctic with its plentiful seasonal game and not wishing to risk an Antarctic winter frozen into the ice, the course was reversed. Erebus and Terror turned around on the 9th of February. Not before time as the sea was starting to freeze, the Erebus and Terror returned to Hobart in April for a three month refit. The following austral summer, Ross sailed south once again, this time he had obtained a chart from the voyage of the L'Astrolabe and Zelee. They entered the pack ice at 60° 50' S, 147° 25' W.This time the pack held them and they drifted helplessly. On January the 19th 1842, both ships rudders were wrecked by ice in a gale and the Erebus had her hull stripped of its copper sheeting. They were not freed from the ice to sail again until February the 2nd when they left the consolidated pack. The furthest south reached was 78° 11'. It would be almost sixty years before another ship ventured so far south again. On March the 13th there was a final brush with disaster as Erebus collided with Terror sweeping away the Terror's bowsprit. The two ships drifted towards two icebergs some sixty feet apart. Terror passed through first before Erebus whose yards (ends of the horizontal wooden poles from which the sails hung) hit the iceberg again and again. 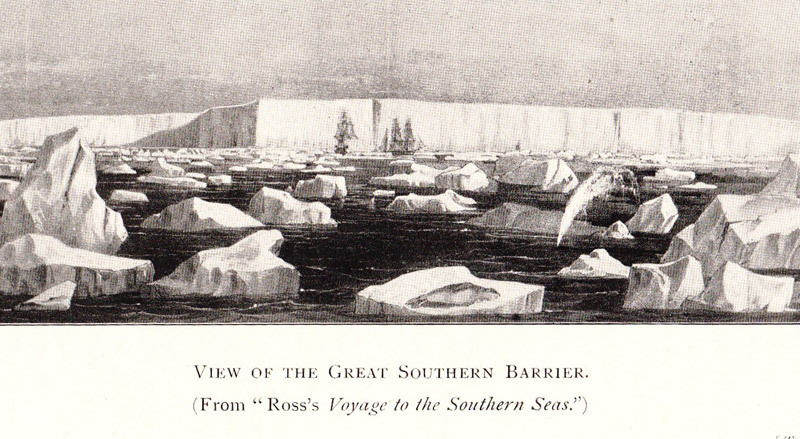 Ross eventually sailed her through the space between the icebergs "by the hazardous expedient of the sternboard". In other words, he sailed backwards. 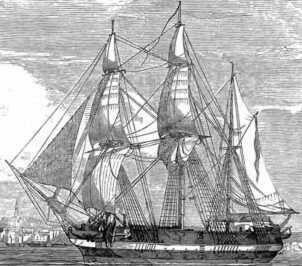 The two ships returned to the Falkland Islands before setting off for the south again in December 1842 to explore the Antarctic Peninsula though they did not get so far as they had done previously. They arrived back home on the 4th of September 1843, four years and five months after setting off. Data had been gathered on magnetism, oceanography and substantial botanical and ornithological specimen collections had been made. It was to be the last major voyage of exploration made entirely under sail. Ross returned to England triumphant and to receive a knighthood. Despite his findings, no-one but whalers and sealers would follow for many years. The Antarctic continent existed and was prodigious in size, though it would be fifty years before any attempt was made to explore the land surface.